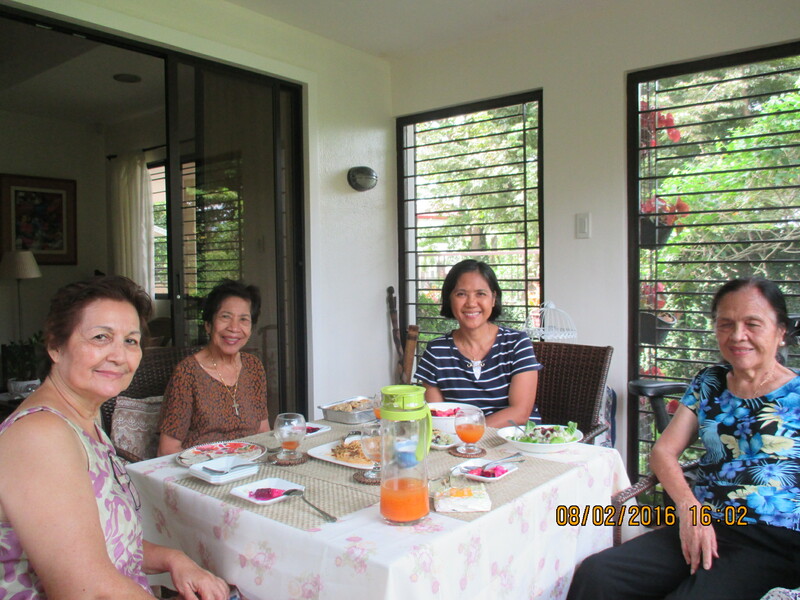 Most of the residents in our village are either retired professors from UPLB or retired employees from IRRI. Many of them live an affluent life, with manicured lawns, and 2- 3-car garage. Yet many are already sick, and for this year alone, four have died already. I feel sad whenever I hear of eminent professors and scientists now succumbing to old age. Some have gone senile, not wanting to meet people anymore. They are highly-educated people. Yet in old age, they just seem to wait for the sun to set on their lives, ignorant of their real purpose in living. How I desire to reach out to them and share the liberating Gospel of Christ. Opening our house for them is a step in the right direction. While taking my rounds of walk at the village park, one sunny morning, I met two of my elderly neighbors, one was supported by a cane. I was happy to see them enjoying the bright morning. I took the opportunity to invite them for a simple snack in our house. They were happy to accept my invitation. I also asked my next-door neighbor to join us. She is 75 years old. I set aside the whole of Tuesday afternoon for the small gathering. Assisted by my able assistant Lani, we served cucumber salad with nuts and dried fruits, pita bread with pesto for appetizer, and fresh carrot and apple juice. For the main dish we had sea-food pasta. The table was set and soon we were all seated on our small table. We talked about many things. I learned that my neighbor with long hair, who looked like 75 is actually 85 years old already. Her mother, she said had reached the age of 100 years and ten months. Their secret? … eating only fish and vegetables. My other Tita, is a cancer survivor. She had hip replacement and heart surgery a year ago. She said, that only her eyes have not gone under the knife. My next-door neighbor is also a cancer survivor. One time, she recalled, she had heat a stroke. Thankfully, she was revived with her two dogs lapping her face. We had fun taking pictures. They enjoyed the food as well. Soon it was time to go. But before they left, we gave them pabaon of oatmeal cookies (from my next-door neighbor) and pita bread, together with a harvest of ampalaya from our backyard. All our labors that afternoon was compensated by the joy I have seen on their faces. “Thank you very much, we really enjoyed it, I should invite you next time”, said my 85-year-old neighbor. It was a first step in establishing friendship that hopefully will open the door for the Gospel.